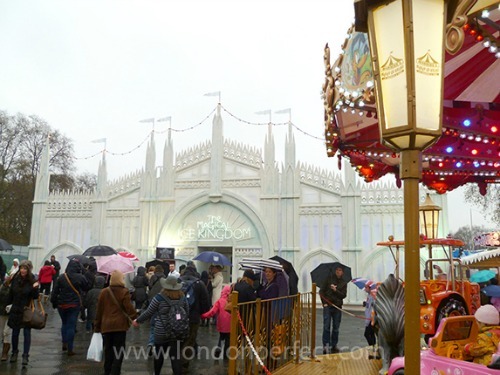 Welcome to Winter Wonderland in London’s Hyde Park! 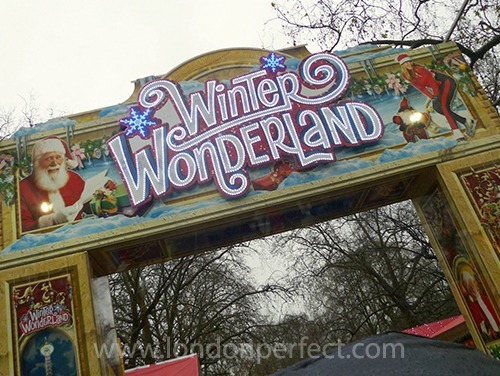 The winter season fun arrives in London when Winter Wonderland in Hyde Park opens in late November. 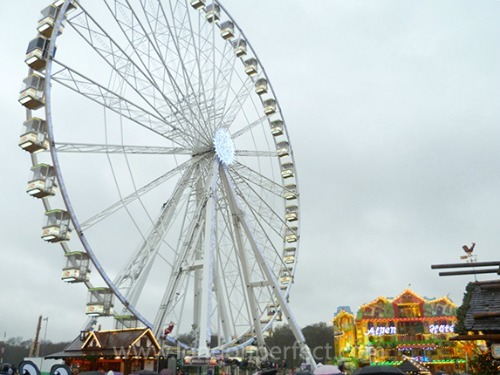 This big Christmas amusement park combines lots of exciting rides for kids, a giant Ferris wheel, shopping at the Christmas Market, games, extravagent ice sculptures, a circus (or two!) and tons of food stalls selling classic mulled wine and other traditional holiday food and drinks. There’s also a fun ice rink set up right in Winter Wonderland, and it’s one of the most popular spots for ice skating in London. 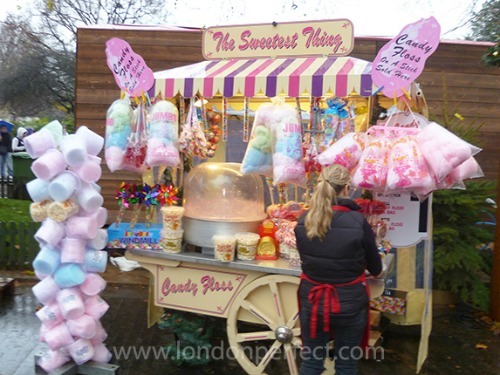 This year Winter Wonderland is open from 23 November 2012 to 6 January 2013, which means you have one more week to enjoy the holiday fun in Hyde Park! Leading up to the holidays, Santaland at Winter Wonderland is a popular spot for families to enjoy the rides, have fun and even visit with Santa Claus. 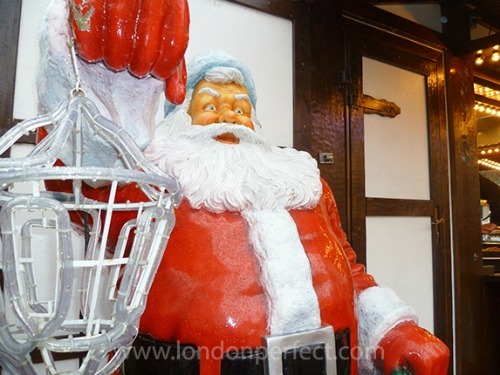 There are lots of great rides for kids to create an unforgettable Christmas visit to London! Santa’s Factory is a new addition to Winter Wonderland this year, and inside the fun house kids can enjoy seeing Santa and his elves getting ready for Christmas. It’s a fun way to get into the holiday spirit with the whole family! 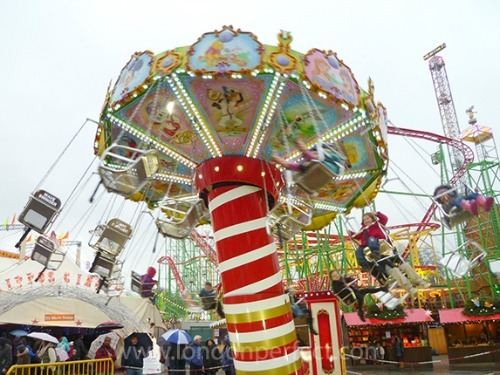 Take a spin on the teacups at Winter Wonderland! While the teacup ride might not be everyone’s cup of tea, the big Ferris wheel at Winter Wonderland is a fun—and less head spinning—ride for the whole family to enjoy. 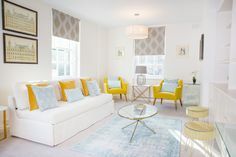 The views overlooking Hyde Park and London from the top are fabulous! 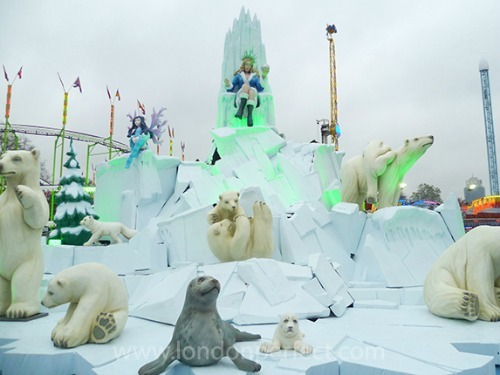 One of the most unique parts of Winter Wonderland is the Magical Ice Kingdom – a huge display of ice and snow sculptures. Inside you’ll find an ice castle, an enchanting forest and a world of fantastical creations. Bundle up to enjoy this chilly but stunning winter display! 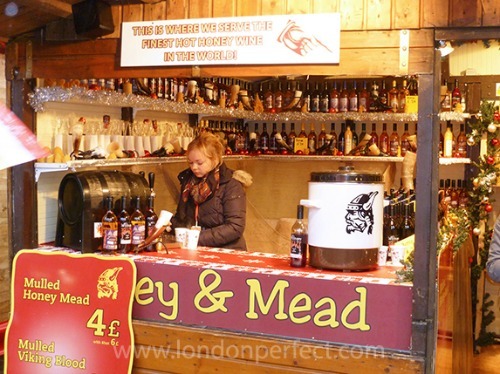 When you’re ready to warm up there are many options, from honey wine, traditional mulled wine, hot chocolate and more. There’s even “Mulled Viking Blood,” a name that was a little too evocative for us, so we stuck with the safer sounding mulled honey mead. 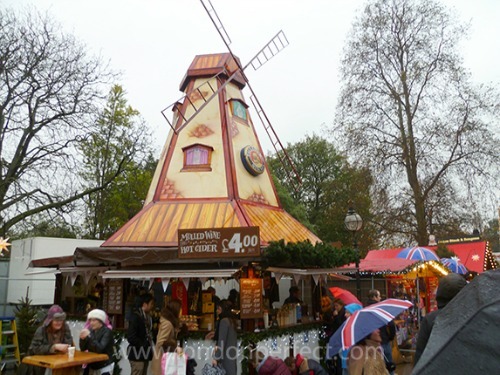 One mulled wine and hot cider stall had a large windmill atop it that made it easy to spot. 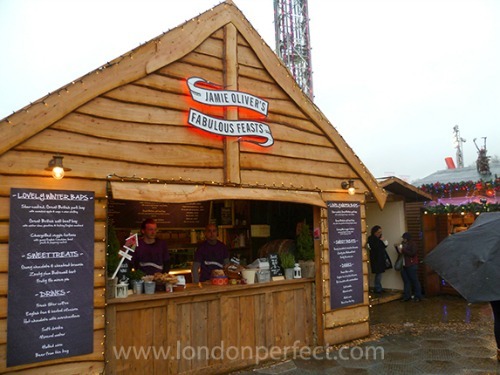 It was a chilly and rainy day – perfect for mulled wine! 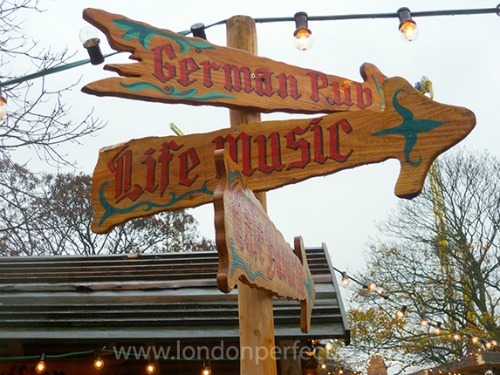 After two glasses of mulled wine, we had to take a photo of this sign as proof that it said “Life Music” and not “Live Music.” Next stop … the German Pub! Ready for “Life Music” at Winter Wonderland! 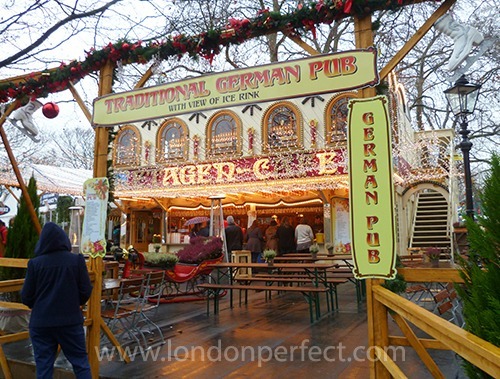 There are lots of food stalls and places to choose from at Winter Wonderland, and this German Pub had a nice view of the ice rink. 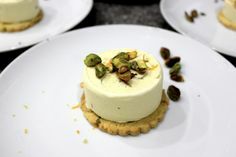 Jamie Oliver’s Fabulous Feasts was also on hand with some tempting offerings. The stalls were all decorated and lit up with Christmas lights, which would be charming after dark. Tons of food stalls including Jamie Oliver’s Fabulous Feasts! After (over)indulging at the food stalls, it’s time for a walk though the Christmas Markets for a bit of holiday shopping. 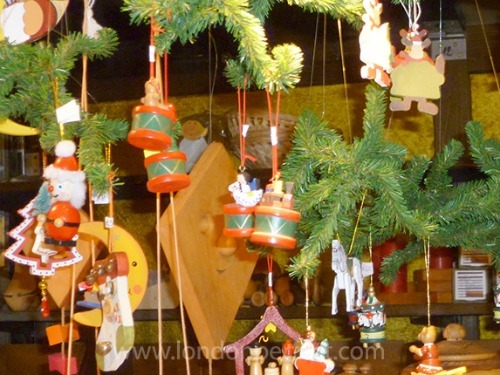 There are two markets at Winter Wonderland, the Angels Christmas Market and the new Yuletide Market, and together they have over 150 stalls dedicated to arts, crafts, toys, holiday decorations and more. 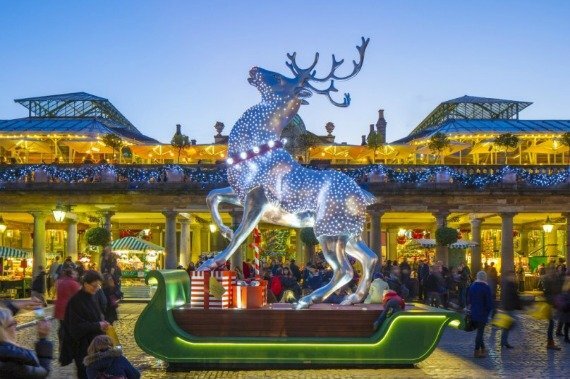 Along with the Southbank Christmas Market along the Thames, this is one fun holiday shopping experience in London you won’t want to miss! After a bit of shopping … it’s time for dessert! 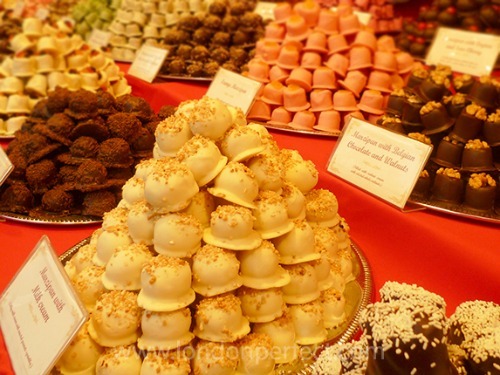 You’ll find a little of everything, from tempting mounds of chocolates and candies on display to cotton candy and holiday sweets. 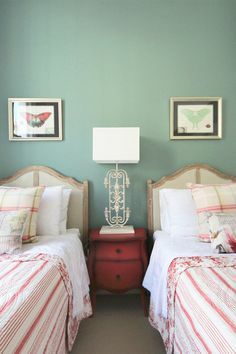 For the sweetest member of the family – cotton candy! 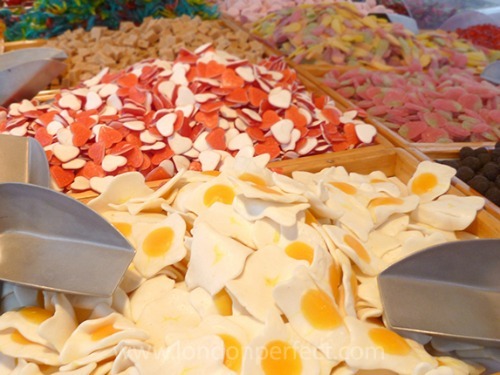 All kinds of candies at the Christmas Market – even egg shaped candies! There are two circus performances at Winter Wonderland this year, the Zippos Christmas Circus during the day and the Zippos Cirque Berserk in the evenings. Tickets for all the events can be booked in advance online, and we highly recommend taking the time to do this so you can be certain to see everything you’d like during your visit to Winter Wonderland. 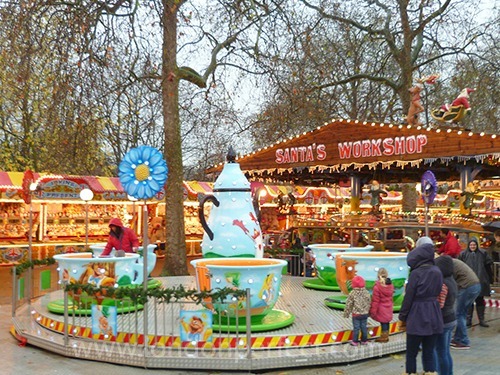 If you’re in London now through January 6th, 2013, head to Hyde Park for some holiday fun at Winter Wonderland! Find out more about the events, how to book tickets and all details at www.hydeparkwinterwonderland.com. Posted on Sunday, December 30th, 2012 at 2:10 pm in What's On. You can follow any responses to this entry through the RSS 2.0 feed. You can leave a response, or trackback from your own site.